Why reporting in actual sample size tested is best practice. This article explains Legionella sample size reporting requirements. Laboratory test reports all have to comply with ISO 17025 requirements for reporting results. Some of the requirements include having a unique identifier (the lab number), citing the receipt and test date, providing a unique description of the sample submitted and in the case of water testing the date the sample was taken. Also if any additional information about the sample’s state should be reported, e.g. incorrect temperature, damaged container etc. This is all before we actually give a result. When reporting the result, it is important that a method reference is provided, and the units of the result is given. For an example see report below. 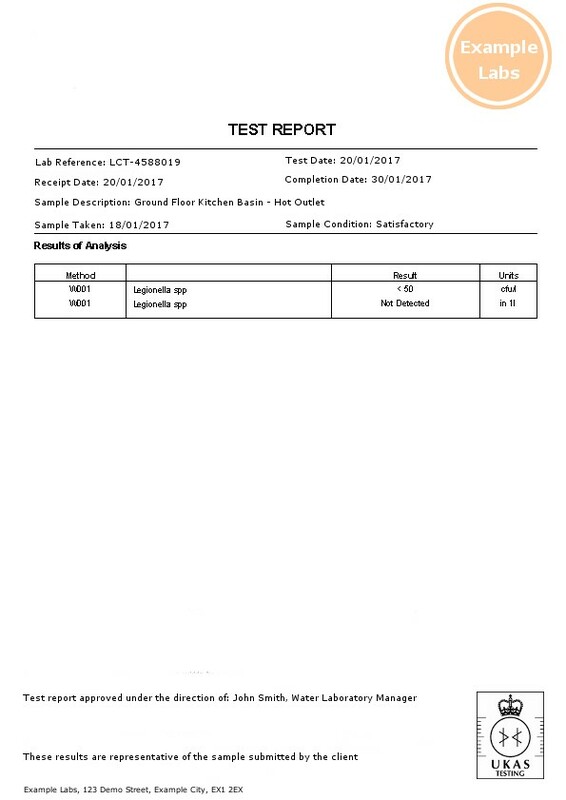 This is an excellent example for reporting legionella, we know the lab number, when they received the sample, when they tested it, what the sample was, we know there was nothing unusual with the sample when it arrived at the lab or nothing untoward happened during the test which followed method \001. It also tells us the limit of detection for the test which is very useful for the end user to know as providing only the result “none found” in 1 litre does not tell us how many could be there but remain undetected due to the limits of the test. It is a requirement of the ISO 11731: Water quality — Enumeration of Legionella, to report the volume of water tested. From this report we should be satisfied that a litre of sample was tested. It has happened in the past that laboratories would sample a smaller volume than 1 litre and make a correction up to 1 litre. This is not allowed in the ISO method and is not accepted by UKAS as valid. Should your laboratory have to test a smaller volume, say 500 ml or less, the accredited result would be for example None Detected in 500ml or 100 cfu in 500ml. When judging against criteria set out in the various HSG and HTM documents the best you can do is multiply the result by a correction factor. In the case of a 500ml sample the correction factor would be 2. But be aware the calculated result (from the example provided 200 ml in 1litre) will not be the accredited result. However, when necessary it provides you a guideline to judge what corrective actions would be appropriate. Best practice is if you want a result in 1 litre get 1 litre of water tested, when this is not possible you can make an adjustment for risk assessment, but should the result be challenged the adjusted result will not be the valid result in a court of law.